Baylor guards Makai Mason (left) and Jared Butler walk off the court after the team’s loss to Gonzaga in the second round of the NCAA tournament. Gonzaga guard Zach Norvell Jr. (left) and forward Corey Kispert relax in the final seconds against Baylor after their second-round NCAA win in Salt Lake City. Baylor guard Makai Mason drives to the lane against Gonzaga guard Zach Norvell Jr. during the first half. Gonzaga forward Brandon Clarke (left) and Baylor guard King McClure work for position during the second half. Gonzaga forward Killian Tillie (top) and Baylor guard Mark Vital struggle for a rebound. SALT LAKE CITY — To have a prayer of upsetting No. 1 West region seed Gonzaga, Baylor needed the nation’s most explosive offensive team to experience a rare off night. Nothing close to that happened. 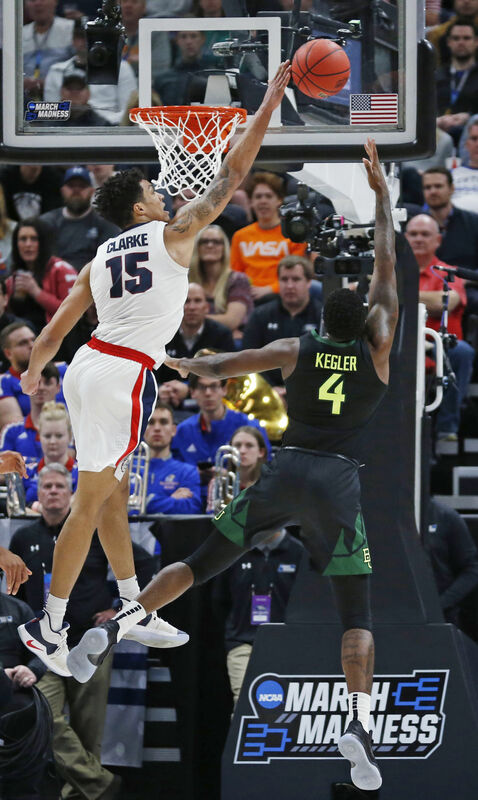 Watching Gonzaga forward Brandon Clarke score at will in the paint with 36 points, the Bears’ hopes of reaching the Sweet 16 died with an 83-71 loss Saturday night in the round of 32 at Vivint Smart Home Arena. With the Bulldogs shooting 54.4 percent and racing downcourt for numerous transition baskets, the No. 9 seed Bears didn’t have the firepower to overcome them. A Baylor team that was picked ninth in the Big 12 and dealt with injuries to key players all season finished with a 20-14 record. It’s a team Baylor’s Scott Drew loved to coach because of its willingness to keep overcoming obstacles no matter what was thrown its way. Drew was especially proud of the leadership senior guards Makai Mason and King McClure showed throughout the year despite their injuries. The Bears got strong going-away games from both guards as Mason scored 17 points with five assists and McClure hit 15 points. Sophomore forward Mark Vital also delivered a passionate performance with 17 points and eight rebounds. But he was hamstrung after he was whistled for his fourth foul when he tried to draw a charge with 16:12 remaining. With Vital facing the possibility of fouling out, the Bulldogs (32-3) kept feeding the ball to Clarke who matched his career high with 36 points on 15 of 18 shooting. The power forward also led the Bulldogs with nine rebounds and five blocked shots. The Bears shut down Gonzaga leading scorer Rui Hachimura, who scored just six point on two of six shots. But Corey Kispert drained four of six treys and scored 16 points while Josh Perkins chipped in 11. After hitting 16 of 34 treys in Thursday’s 78-69 win over Syracuse to open the NCAA tournament, the Bears hit just four of 21 against the Bulldogs. The Bears were no match for the Bulldogs in the first half as they raced to a 39-23 lead. After the Bears took an early 7-5 lead, Gonzaga took command by reeling off 11 straight points. Kispert was the catalyst as he drained a trey from the top of the arc, scored inside for a basket and then broke away for a windmill slam to open up a 16-7 lead. While the Bears struggled to score, everything was going right for the Bulldogs. Geno Crandall tried to hit an alley-oop pass, but it went straight into the bucket for a trey instead. With Clarke dominating inside, the Bulldogs expanded their lead to 16 at the half. During halftime, Drew reminded his team how hard they had fought to come back from big deficits all season. “One of the biggest things was trying to win the 50-50 balls,” Mason said. “We felt like we had a lot of that they won in the first half and we really pride ourselves on getting those. So we tried to not let them get loose balls and not let them get transition 3s. After the Bears hit just one of 10 treys in the first half, McClure and Mason drained 3s to open the second half. Then Vital started driving inside despite foul trouble, and scored nine straight points for the Bears to cut Gonzaga’s lead to 43-38 with 16:34 remaining. But after Vital got his fourth foul, Clarke was relentless inside as he scored six straight points to expand Gonzaga’s lead to 11 points with 14:09 remaining. The Bears kept fighting as they cut the lead to eight with 6:34 remaining when McClure scored on a drive. But Gonzaga just had too many offensive weapons for the Bears to make a serious bid to win. But Baylor fought until the end despite the overwhelming odds against a superb Gonzaga team.